I hate to admit this, but�A Death-Struck Year by Makiia Lucier has made me regret those days where I wished for the flu so I could be out of work for a couple of days without touching my vacation time — I always have this cushion of sick time. Lucier’s debut has made me realize that actually the flu is serious and kind of scary, it’s not just a get out of work free card. You see, I was initially drawn to�A Death-Struck Year because it’s about a disease that spreads really fast, �kind of like a plague, and I just love plague books. It’s actually a really cool read because instead of the plague being fictional, it is something all too real that has happened in real life. I mean, I knew about the Spanish Flu epidemic, but it was always a footnote in the history text book, because instead they choose to focus on World War One and such. What I loved about this book was that it brought an era to life and put the epidemic on such a human level that an interest has been sparked in me. A Death-Struck Year opens with Cleo Berry, main character, at her boarding school reflecting that she wished she had treated her brother, Jack and his wife Lucy better. We then see Cleo reading this book about famous American women and the amazing accomplishments by these women. You see, Cleo has no idea what she wants to do after graduation. Her friends know what they are doing, one is going to New York to become a bohemian. Another is running off with her beau to get married. Another friend is going to university. Cleo, though, has no clue, even though as a member of the upper class, the world is laid out before her. When the deadly Spanish Flu pandemic of 1918 breaks out, Cleo finds herself stepping in and volunteering for the Red Cross. She goes door to door to hand out pamphlets on how to prevent the flu, masks, and also discovers sick people and gets them the help they need. In the meanwhile, her brother and sister in law are in San Francisco, Lucy has ditched out of her boarding school and finds herself staying at home alone. Meanwhile, World War One is raging on and so, not that many young males are home. In her volunteering, Cleo makes friends with Kate Bennett, a young girl her age who comes from a really big family. Kate helps with nursing and is good at it, however that’s not her passion. Cleo also meets medical student Edmund who she kind of finds quite attractive. The feeling might just be mutual. Makiia Lucier’s book is all about people finding themselves in extraordinary, terrible circumstances and rising above to the call of duty. It’s about people stepping in and helping instead of waiting for someone else to do it. Cleo’s just the character for you if you enjoy reading about young women who are at a crossroads in life. It’s interesting the parallel between Cleo, a girl in 1918 and girls today in 2014. In both situations it seems girls have to make big huge life choices at the age of 17, where to go to college, what to major in, what to do after high school. I think teenagers will absolutely see themselves in Cleo’s character. What I also liked about her is that she starts the book as being not quite strong and heroic, but because nothing has really been demanded of her it makes sense. When the flu pandemic happens, instead of hiding out in her house and waiting for it to pass, Cleo finds herself in the trenches volunteering for the Red Cross. She is unexpectedly brave and quietly heroic. In fact, she keeps her volunteering from her brother because she doesn’t want him to stop her. I loved that Cleo did not trumpet her acts of heroism. She’s absolutely a main character to admire. I really loved how�A Death-Struck Year delved deeply into the Spanish Influenza. I liked that we got to see it spread from the East Coast to the West Coast. I liked reading about how people would combat the flu by sleeping with their windows open and taking walks and wearing masks. It’s interesting to see how people dealt with diseases when they do not have the medical advances we do today. It really struck me how the flu killed young adults, people who should be hale and least susceptible to the flu. It’s scary to think that this could also happen today. Finally, I want to end on the romance note because hey, if you are a reader who is at all similar to me, that is going to be what you really, really care about. Well, Makiia Lucier certainly delivers the swoons. I loved how Cleo Berry’s romance played out. Her love interest is older than her, but carrying scars of his own. There’s an instant attraction between the two, but they don’t act on it. There is not instant love, but this slow burn that happens rather quickly when you look at the dates in the chapter headings. Yet, it makes sense you know desperate times and desperate measures. I loved the romance aspect to pieces.�A Death-Struck Year totally deserves your reading time if you showed up for the romance. I want this! I too love reading about diseases, especially when paired with historical fiction and this is defo not something we learn about over here. And yes, it is scary to think how easily this could happen now, even with all our drugs and knowledge. 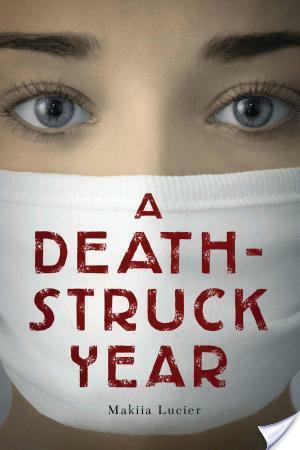 I am seriously excited to read A Death-Struck Year. It definitely sounds different from a lot of historical YA fiction, since the author chose to focus on a lesser known period of time in history. I’m glad you wound up liking this one so much!